Reblog of a new post by materials physicist Dr. Charles Anderson, which discusses the recent paper by Chilingar et al posted here. Dr. Anderson improves upon some aspects of the paper, but in general comes to the same basic conclusion that additions to the present levels of the greenhouse gases CO2, H2O, and methane will cause cause cooling, not warming, of the Earth surface & atmosphere. So if the present average temperature of the Earth is taken to be 288.2 K, the net warming effect of all of the present infra-red active gases is 9.8 K. This is a far cry from the 33 K warming effect which is often claimed as the result of the so-called greenhouse gas effect. 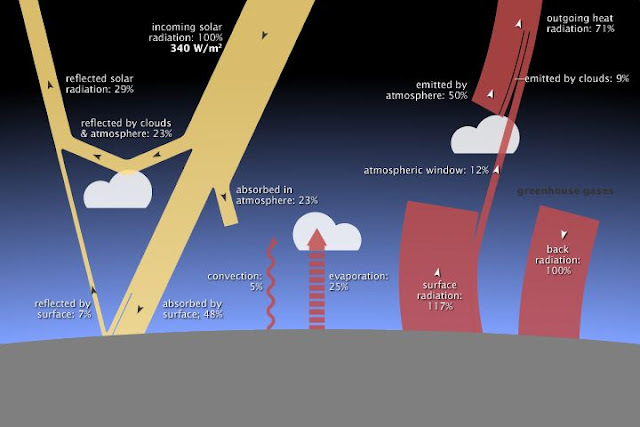 But it is true that without the so-called greenhouse gases, the Earth’s surface would be cooler than it is now because the surface itself would be in radiative equilibrium with space instead of a combination of the surface, a more heavily weighted altitude at the top of the troposphere, and a much lighter weighting of the stratosphere. So, it is not a foregone conclusion that adding CO2 to the present mix of gases in the Earth atmosphere will cause further warming, just because the additions of the first molecules did cause warming. We do not immediately know whether the so-called greenhouse effect is increasing or decreasing with further additions of greenhouse gases. This is a question I have been discussing for years on this blog and since I wrote a book chapter called "Do IR-Absorbing Gases Warm or Cool the Earth’s Surface?, in Slaying the Sky Dragon -- Death of the Greenhouse Gas Theory, Stairway Press, published in January 2011. Of course, the presence of water on the Earth’s surface and water vapor in the atmosphere causes the Earth’s surface to be warmer than it would be without water, but unlike the common assumption, this does not tell us that further additions of the so-called greenhouse gases will cause further warming. I have many times explained why the physics commonly and vaguely offered as the reason why such gases would continue to warm the Earth’s surface is wrong. This is a very good explanation of both the gravito-thermal effect and the thermostatic role IR absorbing gases play in regulating planetary temperatures. "This absorption effect is large at first, but becomes rapidly smaller as the number of infra-red molecules becomes larger." If he's referring to IR gas concentrations less than "critical mass," I would phrase it differently. The absorption effect plateaus rapidly as the number of IR molecules reaches a critical level. In any case that additional IR molecules cause cooling seems plausible given the effectiveness of convection/advection and that more IR active molecules in the air means there are more in the upper troposphere to radiate to space. O3 is similar in effect at a lower band.